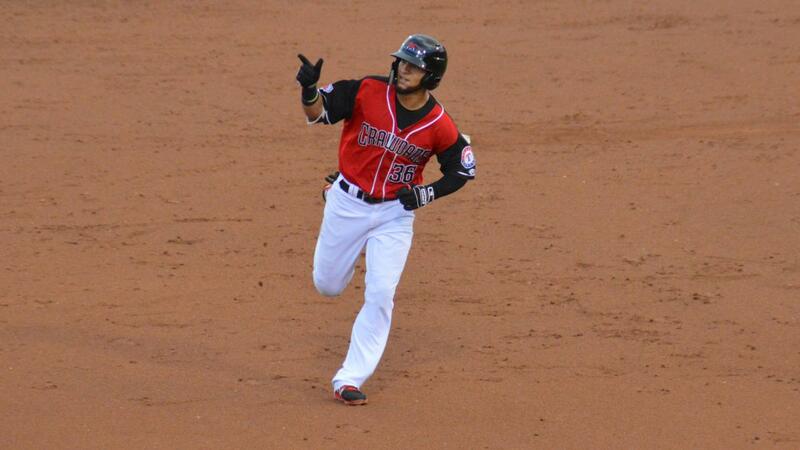 Hickory, NC- The Crawdads fell to the Greensboro Grasshoppers 9-5 on Saturday night. Miguel Aparicio put the 'Dads ahead in the third inning with a solo homerun. The homerun was his eighth of the season. The Grasshoppers took the lead with a trio of runs in the fifth inning. 'Dads starting pitcher Noah Bremer finished the night with five innings pitched and three runs allowed on seven hits and two walks. He struck out five batters. The Grasshoppers widened the deficit with six runs in the seventh inning off reliever Joe Kuzia to take a 9-1 lead. The Crawdads got two runs back in the home half of the inning to make the score 9-3. Ryan Dorow doubled and Tyreque Reed hit his eighteenth homerun of the season. The 'Dads rallied again in the ninth but were unable to tie the game. Yohel Pozo got things started by reaching first on a throwing error. Preston Scott followed up with a single. Both runners advanced on a wild pitch. Kole Enright drove Pozo and Scott in with a single to center that cut the score to 9-5. Aparicio singled and Justin Jacobs drew a walk to load the bases and bring the tying run to the plate with one out. The 'Dads were unable to get any more across. Wins from West Virginia and Kannapolis eliminated the Crawdads from playoff contention tonight. To secure the wild card the 'Dads needed to win their final three games while West Virginia and Kannapolis lost all three of their remaining games. The series against the Grasshoppers continues tomorrow night with a 5pm game. It will be Bark in the Park and all dogs will get in free. Fans who bring in a church bulletin will receive a discounted $6 ticket. The 'Dads will then donate $4 back to that bulletin's respective church.